Sobhan Babu’s Vajrotsavam a Grand Gala Event! To mark the 75th birth Anniversary of legendary actor Sobhan Babu, a huge Vajrostsavam celebration was held in Hyderabad yesterday. The function which was held at Shilpa Kala Vedika in Hyderabad saw Dasari Narayana Rao, Krishna, Ramanaidu, Krishnam Raju, Venkatesh, Jayasudha and politicians like Sushma Swaraj and the honorable chief minister of Andhra Pradesh Kiran Kumar Reddy, attend this grand gala function. All the dignitaries spoke very highly about the versatile actor and his achievements. The Vajrotsavam was conducted by Sobhan Babu’s fans from all over Andhra Pradesh. This mega event also saw 75 film artistes who have worked with Shobhan Babu in the past getting financial help in the form of Cheques. Speaking on this occasion Dasari said Shobhan Babu is the only actor who has received the Filmfare award for best actor six times. 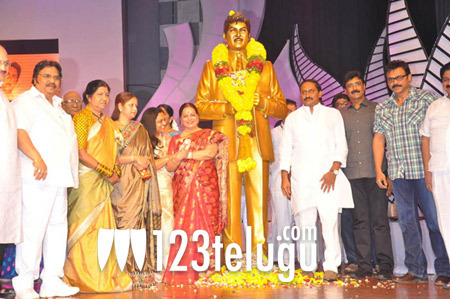 Sobhan Babu had a huge following among the ladies in particular and was well know for his family oriented roles. He acted in over 200 films in his illustrious career spread over two decades.